Fresh Perspectives: I Got In! Now What? 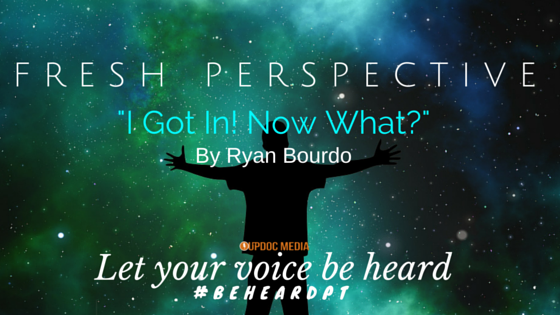 Today’s Fresh Perspectives comes from #DPTstudent, Ryan Bourdo. He shares his thoughts on how he got into this world of physical therapy. And, what I truly appreciate about this post is this common drive we see in this generation of millennial professionals to become more & to challenge the status quo. All they need is guidance, direction, and the support of positive mentors. As I mentioned over and over again at #APTACSM, nobody needs permission to be excellent, to be successful. If you “have to” do something, then go do it! I think we’re about to see an entire generation of physical therapists ready to go “do,” to go become more, and to make a transformational splash in a truly impactful way. So, without further ado… take it away, Ryan!!! Welp, I am in physical therapy school. After not getting into medical school, floundering for about a year, and working as an aide for two, I am finally pursuing my dream career. I know I will become a physical therapist (he says with blind confidence), but now, I am lousy with choices as to what kind of therapist I can be. And, I am not just talking about in-patient versus out-patient. What are my philosophies as a therapist? How can I best contribute to this industry as a whole? Who is right? Oh God, WHO IS RIGHT?! There are just so many options and opinions out there. But, enough generalities; let me take you into my current thought process. Should I become a sports physical therapists? And if so, do I need to get my CSCS? What about a residency program? Would it be best to specialize, or, be a generalist? Or, should I jettison all of that and go into pediatrics? I also want to become a race director in my community and get involved in promoting healthy lifestyles. On top of all that, learning more about healthcare economics is fascinating to me and would love to work more to help shape healthcare policy. The point is, I like a lot of things. But, how am I going to utilize these things to help shape my career? In college, I did too many things: shadowing MD’s, researching, working 20 hours/week, volunteering at the health center, and going to school. And, while I loved all of it, I definitely felt I wasn’t putting 100% of my effort into everything. I don’t want that to happen in my future career. So, how do I choose? I want it all! And, it is not just what kind of career I want, I need to figure out what kind of person I want to be as well. Being in just my second semester of PT school, I am already overwhelmed with the amount of opinions on physical therapy in general. From modalities, exercise regimens, to just our general scope as therapists, I have no idea whose opinions I agree with. Currently, I love listening to PT Pintcast and listening to the different perspectives from the therapists Jimmy McKay talks to. But, I often find myself agreeing with everyone, even those who offer contradicting opinions. Reading different blogs is great too; but, there are just so many out there, I have no idea what to do with their information (and yes, I am aware of the irony in this complaint). And, don’t get me started on Twitter; trying to jump in on those conversations is a double-dutcher’s nightmare. I understand this is all self-induced/inflicted worry. And really, the masochist in me really loves all of the worry. Wading through scores of opinions, trying to find a through line that resonates with me has been a lot of fun. It is my career Rubix Cube. Right now, I am just trying to consume everything I can, and, see what shakes out. This isn’t ground-breaking stuff; but, for someone who has been trying to find their dream career for so long, it certainly new territory for me. Now if you’ll excuse me, I have to go and catch up on the fifty other blog articles that were posted by the time I finished this one. Ryan Bourdo graduated The University of Oregon with B.S. Degrees in Biology and Human Physiology in 2010. 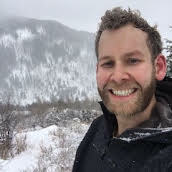 Originally thinking of medical school (nevermind the fact that medical school rejected him twice), he soon fell in love with physical therapy, thanks to an amazing therapist in Portland, Vince Blaney, MSPT. Vince showed him everything he originally wanted to be as a physician: using anatomy and physiology to help those with injuries. He soon worked as a physical therapist aide for two years and is currently at Regis University completing a Doctorate of Physical Therapy. In his free time, Ryan likes to run, boulder, and cook. You can find Ryan at www.ryanbourdo.com, on Twitter @RyanBourdo, or email him at bourdo.ryan@gmail.com.